It happens every congressional election year, like death and taxes. Like father, like son, Duncan Hunter don’t need no stinking debates. Hunter Sr. was infamous for ducking debates against contenders. Now, his son, and heir to the 60-percent Republican registered 50th Congressional District fiefdom of a seat, is following the same path in daddy’s footsteps. Hunter has no problem debating news anchors about how great Señor Trump is for the country. In the last two weeks alone, while ducking the home district debate call, Hunter had plenty of time to appear on Fox News spouting flaky conspiracy theories about Hillary Clinton’s health. Hunter also had lots to say about San Francisco 49er quarterback Colin Kaepernick’s National Anthem protest just prior to the final NFL exhibition game between the 49ers and San Diego Chargers this month. “He probably fits in very well in San Francisco,” Hunter said in an interview on the ESPN/ABC podcast, “Capital Games.” “That might be one of the reasons that he’s able to do this or feel confident about it. For the record, as with most things Hunter and his buddy Trump say, didn’t happen. The only boos we hear are from voters who ask why this guy refuses to debate. He’s such an articulate guy even opining on how Trump “misspeaks a lot,” you’d think he’d be eager to debate his opponent and show him what it’s like to get some. When it comes to his own district, Hunter isn’t exactly a paragon for transparency. He’ll go on ESPN, Good Morning America, Fox and CNN, just won’t go on at the local community center or wherever people would gather for an honest discussion of local issues. 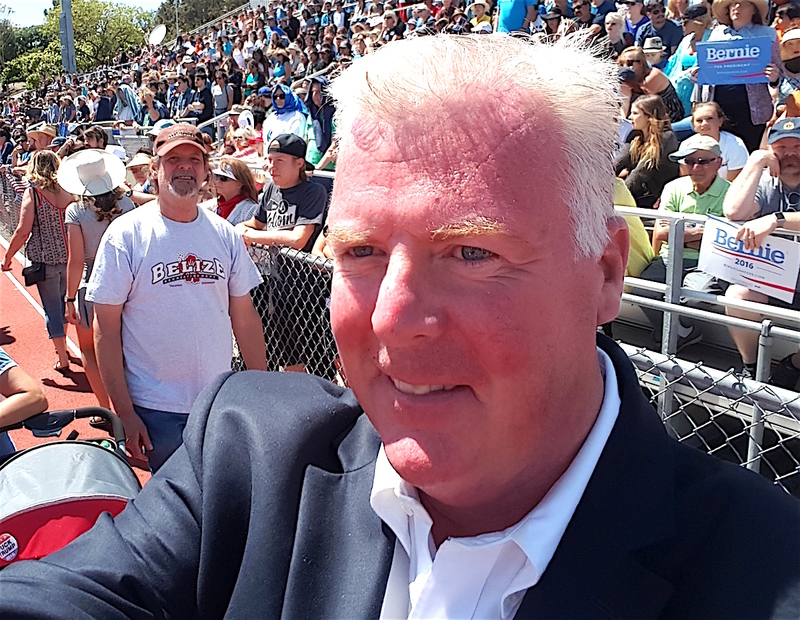 Patrick Malloy campaigns at the Vista Bernie rally in May. Democrat opponent Patrick Malloy, like so many challengers for the gerrymandered GOP House District before him, has called on Hunter to put up instead of shutting up, although the legions who detest Herr Trump probably wish he would. Hunter’s Trump trolling simply is embarrassingly deplorable, but we digress. “It has been over three weeks since I challenged Hunter to debate and there was no response from him by the requested date — Sept. 4, 2016,” Malloy said. “This is a disappointment for me, but a tragedy for the voters of the district because they will not have a chance to see in depth the machinations and flaws of the incumbent. Malloy criticized the incumbent for not having the “common decency” to respond to the debate challenge. Apparently, that, like pretty much everything Hunter says, isn’t true because Hunter isn’t interested in debating in front of the people of the 50th Congressional District, telling voters his views. He only goes on national TV shows to defend Trump or talk about ridiculous things like his love of vaping and passing out “free cigars” to active military. Can Duncan Hunter come out and debate? Be the first to comment on "Can Duncan Hunter come out & debate?"